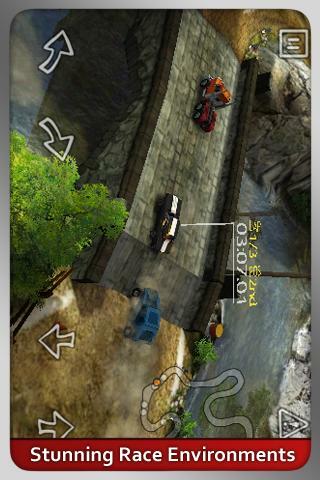 Reckless Racing for Android - THE DIRT-ROAD RACING GAME YOU'VE BEEN WAITING FOR! 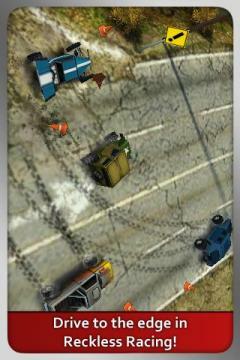 Reckless Racing blends the finest top-down racer style with graphics that are so stunning you will shout, "Oowee!" Skid, slip, and slide through down-and-dirty racetracks with precision controls, and challenge friends in online multiplayer. Hold on tight and get ready to go. This here is Reckless Racing! Yeehaw! The remarkable visual power of the game puts you in the heart of Dixie, where you’ll encounter wonderfully detailed backroad racetracks. Dirt track or asphalt, truck or rally car – take your choice and then take it to the limit. Learn the basics and choose from a variety of driving controls. Progress through the races and move up through Bronze, Silver & Gold difficulty levels. Adapt your race skills and take on an outrageous cast of characters, including Otis, Lurlene, Cletus, Floyd, and, of course, Bubba. You’ll be hootin’ and hollerin’ along with them in no time flat! THINK YOU’RE BETTER THAN THE REST? With online multiplayer, Reckless Racing gives you the chance to show the world your racing ability! Post your best times on online leaderboards and trade ghost races with players from all over the world. Chat functionality is also built in! Immerse yourself in the world of no-rules driving. Take on the Dirt Rally, Hot Lap time trial, or Delivery time trial. Beat other drivers or beat the clock. Either way, there’s a lot of Reckless Racing to do! An adrenaline pumping 3D racer, featuring cross-platform multiplayer!